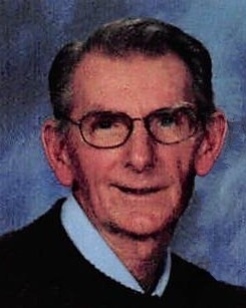 George Leo Niggemyer, 84 of Zanesville died at 11:47 AM Monday, March 18, 2019 at the Genesis Morrison House Hospice following an extended illness. He was born December 21, 1934 in Wheeling, WV the son of Bernard Niggemyer Sr. and Helen Catherine Kerkhoff Niggemyer. George was a member of St. Thomas Aquinas Catholic Church, a United States Army Veteran and a member of the Knights of Columbus #505. He graduated from West Liberty State College with a degree in education. He retired after 30 years of service as a schoolteacher with the Frazeysburg and Tri-Valley School District. He is survived by his wife of 57 years, Renee Dolores Luccy Niggemyer; his children, Lisa (Mark) Trainor and Brian (Tiffany) Niggemyer; Grandchildren, Noah, Dylan and Sydney Trainor, Owen and Macy Niggemyer; Siblings, Mary Elizabeth “Liz” Trischler, Robert (Patti) Niggemyer, Paul (Julia) Niggemyer, Ralph (Martha) Niggemyer, and a sister-in-law, Diane Caruso; as well as many nieces and nephews. George was preceded in death in addition to his parents by a brother, Bernard Niggemyer Jr., a step-mother, Margaret Osterman Niggemyer, father-in-law Samuel Charles Luccy and mother-in-law Lillian Dorothy (Thomas) Luccy and a brother-in-law, Ralph Caruso. Friends may call 2:00 PM to 4:00 PM & 6:00 PM to 8:00 PM with Christian Vigil at 7:45 PM on Wednesday, March 20, 2019 at the Bryan and Hardwick Funeral Home. Funeral mass will be celebrated at 1:00 PM Thursday, March 21, 2019 at the St. Thomas Aquinas Catholic Church with Fr. Thomas Kamau as celebrant. Burial with Military Honors will conclude at Mt. Olive Cemetery. Memorial Contributions can be made to St. Thomas Catholic Church. A special thank you to the nurses and staff at the Genesis Morrison House Hospice for their care and attention. The Bryan & Hardwick Funeral Home, 2318 Maple Ave. Zanesville is in charge of the arrangements. To share memories and condolences with George’s family please click the Tribute Wall tab on this page.